It was time again for runners and theme park junkies to stride their way through the Walt Disney World Resort. The annual Walt Disney World Marathon Weekend showcased several races from a 1-mile kids’ race to a full 26.2 marathon. More than 66,000 runners gathered in sunny, warm Central Florida to participate in the biggest race weekend in the country. Continue through the page break for a recap of the weekend’s events and activities. The highlight of this year’s Walt Disney World Marathon Weekend was the full marathon race held on Sunday morning, January 13th. This year the full marathon was celebrating its 20th anniversary. runDisney decided to celebrate it with a brand new medal design for marathon finishers and what runDisney officials called a “mile 20 spectacular” signifying a lot of special entertainment surprises along the 20th mile of the marathon course. Since this was Disney’s biggest race weekend of the year, the health and fitness expo held at ESPN’s Wide World of Sports was also the biggest of the year. Both the Jostens Center and HP Pavilion were both fully used to allow runners to pick up their race packets and purchase running gear and novelties for race weekend and future race events. The expo was extremely busy and crowded. Runners found themselves bumping into each other along the pathways. The expo was full of merchandise and gear for runners to purchase. 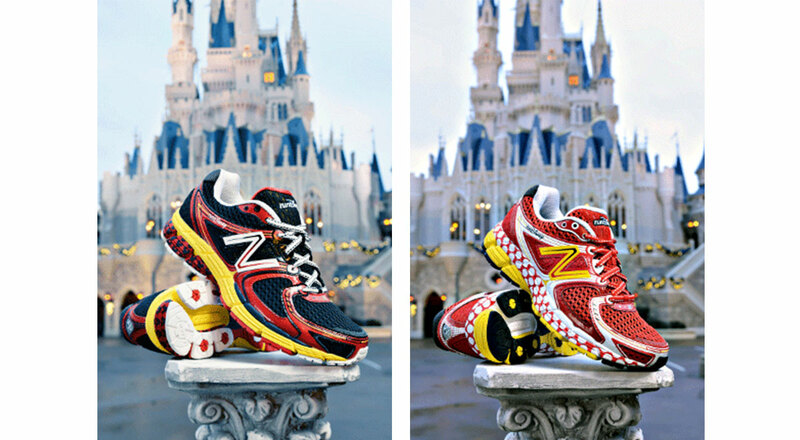 runDisney recently signed a merchandise contract with New Balance. This agreement brought the hottest item to the Expo- a new designer runDisney shoe featuring Mickey and Minnie images and colors. These limited edition running shoes sold out within hours of the expo’s first day. 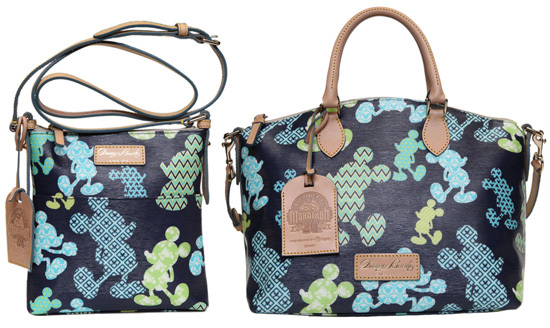 Disney also capitalized on their Dooney & Bourke contract by selling a new line of runDisney bags and purses. These items also proved to be extremely popular. Runners had the opportunity to sit through seminars from running experts and get demos from companies who provide running services to novice and amateur runners alike. The weekend’s races kicked-off on Thursday afternoon with a set of kids’ running events at the Wide World of Sports track and field complex. The kids’ races took place throughout the weekend at the same venue. They included a 1-mile run to 400 meter race, to a diaper dash for the littlest of baby crawlers. Each running child was treated to a finisher’s medallion, post-race refreshments, and the satisfaction that they finished their race. As the morning heat crept over the Disney World landscape approximately 16,000 runners towed the line for the Family Fun Run 5K on Friday morning. The 3.1 mile trek took runners around EPCOT’s backstage area and through World Showcase and Future World. The race featured character stops and took runners past some of EPCOT’s most iconic attractions like Spaceship Earth. Several families used this race as an opportunity to encourage running as a fun and healthy fitness activity. All finishers were awarded a Disney rubber medallion once they crossed the finish line. On Saturday morning the race activities heated-up (and so did the temperature) with the start of the Walt Disney World Half Marathon. The forecasted temperature and heat index forced runDisney to post a heat advisory for the runners before the half marathon began. The race started at 5:30AM inside the EPCOT parking lot. Approximately 28,000 runners made their way slowly to the starting corrals. Reports suggest it took some guests over an hour to walk from the race staging area to their assigned corral. Some runners reported missing the start of their race corral because of how long it took to walk and load the corrals. Once the race did get started runners made their way down World Drive towards the Magic Kingdom. The featured portion of this race was a 2 mile run through the Magic Kingdom park complete with a stroll through the middle of Cinderella’s Castle. Fans lined Main St. USA and greeted guests as they entered the park. For those runners who were competing in Goofy’s Race and a Half Challenge (over 20,000 runners), the half marathon was just the first leg in completing a 39.3 mile race. 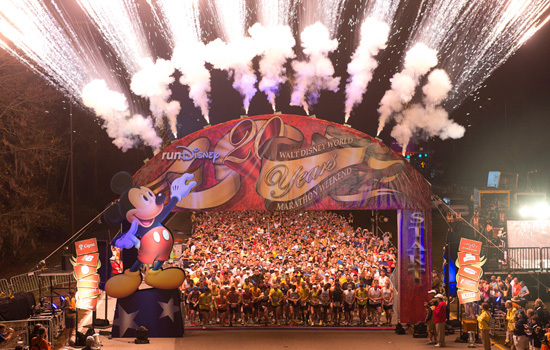 The Goofy Challenge requires runners to complete the half marathon on Saturday and then the full marathon on Sunday. Those who complete the challenge receive a special Goofy medal after they finish the marathon on Sunday. Sunday morning showcased the race weekend’s main event- the 20th edition of the Walt Disney World Marathon. Most agree this is runDisney’s biggest race of the year. It’s a 26.2 mile trek through all 4 of Disney World’s theme parks, the Walt Disney World Speedway, and the ESPN Wide World of Sports Complex. The race started and finished at the same location as the half marathon near EPCOT’s parking lot. This year’s marathon winner Adriano Bastos from Brazil finished in a little over 2 hours and 21 minutes. Bastos is not an unfamiliar face to the Disney World Marathon. He’s won it 7 out of the last 9 years. In the women’s division Virginia’s Renee High won for the second year in a row. This year the Marathon saw a few stars come out. 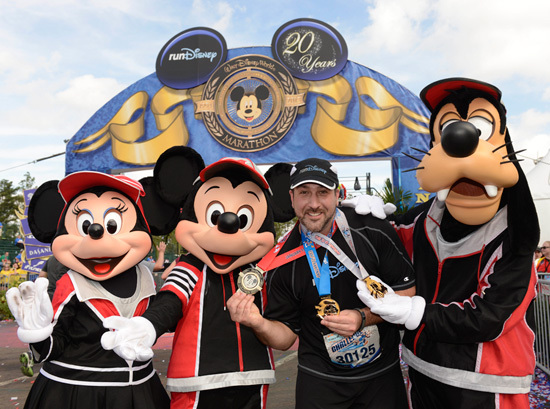 Of the 25,000 runners in the race Pop star Joey Fatone completed his first marathon and the Goofy and a Half Challenge. Drew Carey who was scheduled to run the marathon had to pull out because of a knee injury. He did greet guests at the start of the half marathon. Other stars who participated in the race weekend were Alison Sweeney, host of the Biggest Loser, and Colin Coward of ESPN Radio. For those who completed their first marathon or running event- congratulations! 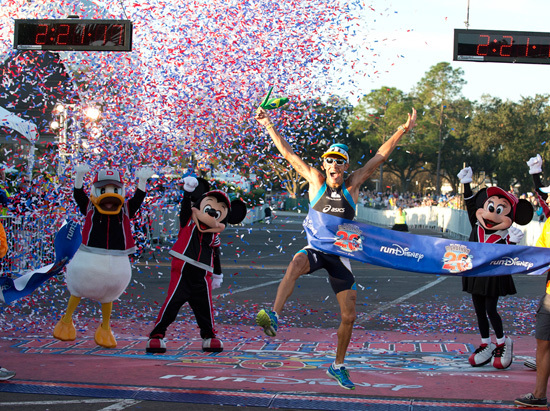 The 20th edition of the Walt Disney World Marathon Weekend was marked with several individuals who conquered firsts. Several runners pointed to the heavens as they crossed the finish line, or shed some tears after conquering the distance they never thought they could complete. It just goes to show you if you put your mind and effort behind a goal you can achieve it. A little help from Disney with their race scenery and entertainment doesn’t hurt either. So, what are you waiting for? 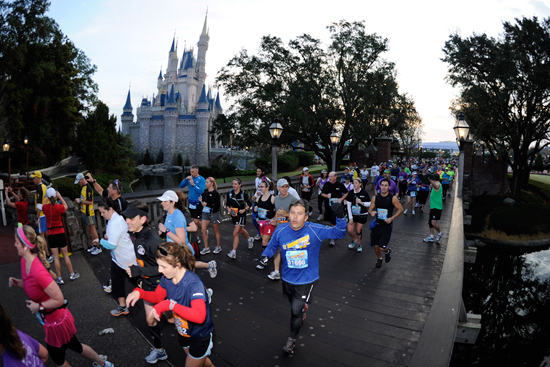 The 2014 Walt Disney World Marathon Weekend is less than a year away. Running through a Disney theme park is an awesome experience you should try at least once in your life, especially if you are a running junkie or theme park fanatic. A runDisney race would be a great choice for your first attempt at crossing the finish line. Just remember, you can’t finish a race unless you start. Give it a try. We hope to see you on the road in 2013 or 2014 for the 21st edition of Marathon Weekend.